Since you’ve been expressing a lot of enthusiasm and curiosity about the core wardrobe concept, I thought it might be helpful to introduce you to an app I’ve been playing around with. It’s called Stylebook. I’m not going to lie to you; it’s glitchy and takes a bit of time to get set up since you need to take a photo of every item of your clothing to use it. But so far I’ve been enjoying it. It’s also fun to play with the app since it can inspire you to try combining clothes in ways you hadn’t considered before. And I would imagine that it might help you to see what’s missing in your closet to help you wear the things you already own more often. (Maybe you need a pair of gray trousers to pull everything together, and by looking at your existing clothes in Stylebook you suddenly realize that’s what you’re missing.) I’ve been gradually entering my clothes into it, trying the different features and learning how it works. I also just noticed that they have a blog that helps with navigating the app, too. I’ll keep playing with it more as I have time and let you know how it goes. If you start using it let me know what you think, OK? You’ve been sewing so many wonderful projects and posting then to Instagram that I thought it would be fun to highlight a couple of them every Friday. Here are two that caught my eye this past week. Lindsay and I were wearing virtually the same outfit last weekend: a City Stroll Wrap Skirt and, in my case, a Maritime Tee. And isn’t this Seashore Sundress outfit completely adorable? I love the bright yellow print! 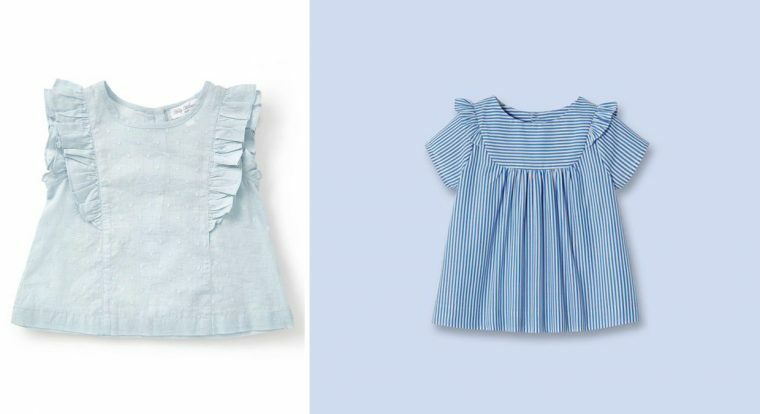 The shoulder ruffle trend started in women’s fashion a couple of years ago, and now it’s trickled down to kids’ clothes (where I think it’s much cuter, frankly). You could do something very similar with our Oliver + S Hide-and-Seek Dress. Do we need a tutorial for this? If you’ve drafted and sewn a flutter sleeve (page 22 in the Building Block Dress book) this will be really straightforward for you. 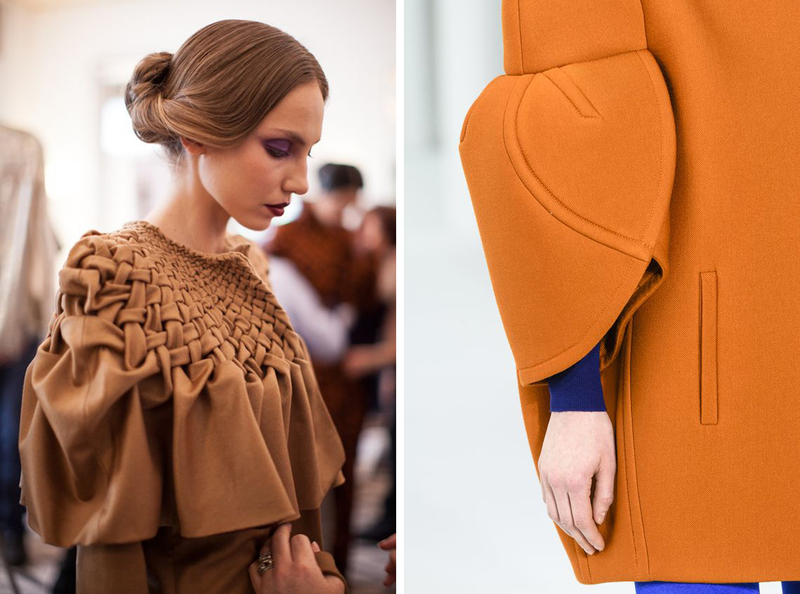 Here are a couple of stunning details that caught my eye on Pinterest. So beautiful and inspiring! Both of these photos have such rich texture. 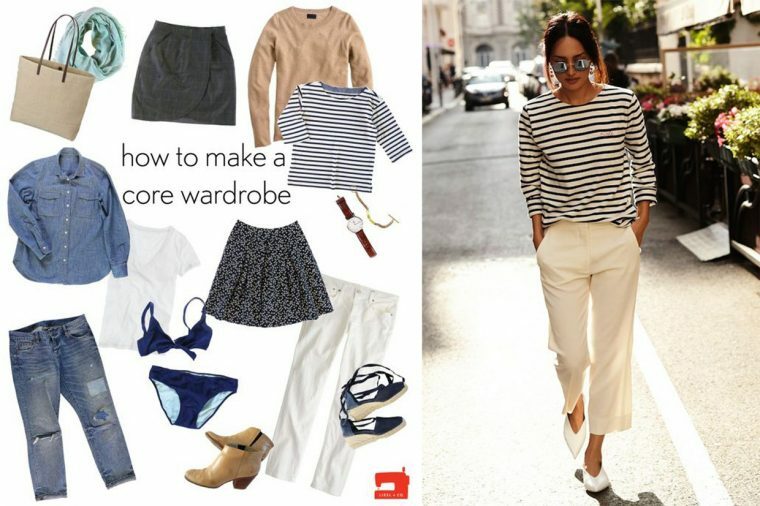 Speaking of core wardrobe, when I saw the image below, right, it got me thinking how cream-colored tropical wool trousers would be a great wardrobe addition for spring and summer in place of white jeans, especially if you work in a corporate environment. They can be dressed up or down, so they’re versatile. And they’re also just fresh-feeling because they brighten and lighten your outfits. Has anyone tried adding a woven skirt to our Lunch Box Tee pattern? With the little pocket, this is just adorable. I also really love the outfit below, right, which might inspire Lunch Box Culottes and Tee with a peplum ruffle. The ideas are endless! If only there was enough time to sew them all. S would love this outfit, so I may put it on my list. You might already know I’m a podcast fanatic. I listen to them when I work, when I run, sometimes when I wake up in the middle of the night and can’t get back to sleep. (It’s been happening a lot these days, see below.) Anyway, one of my new favorites in Hidden Brain, and the most recent episode was particularly interesting. Money Talks, #69, which talks about how we express ourselves and our values through our purchases. When I worked in book publishing I mostly published books on science and mathematics, so I like to keep a toe in the water when it comes to science and scientific research. It’s Fashion Revolution Week, and I apologize for not reminding you sooner. (Truthfully, there’s just too much on my plate right now. Help!) But it’s important, and this is why. So, really, every week should be fashion revolution week, right? And here’s why it’s really important that we’re careful how we talk and think about fast fashion. It shouldn’t become a class issue. 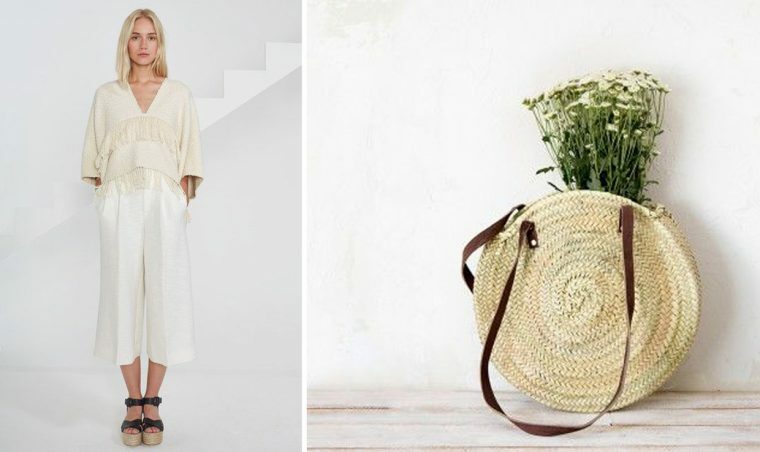 And one more link on the slow fashion/Fashion Revolution Week theme: Karen’s post on this topic is very thoughtful and has provoked some good discussion. The history of the sewing machine. Who knew? Has fashion gone too far? The past couple of months have made me think YES. It’s gotten quite ridiculous, actually. One more, just for fun: I’m a Hamish Bowles fan and think he would be good fun to know. OK, have a great weekend! 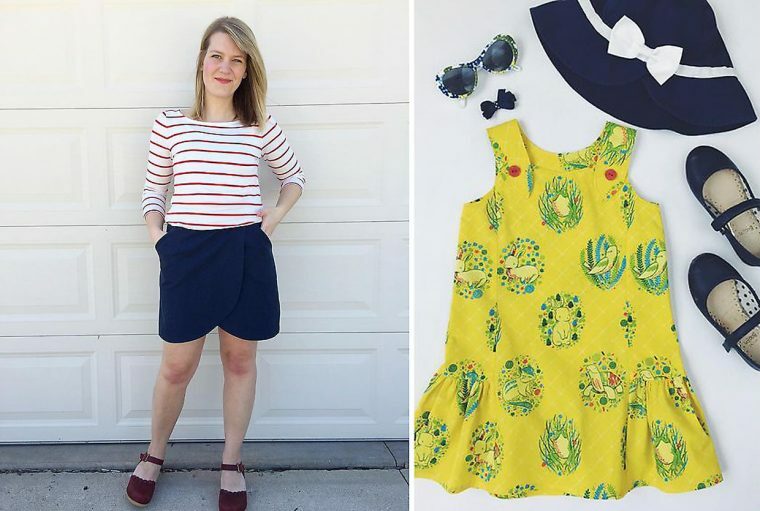 Hurry back next week because we have a fun tutorial, I’ll show you a dress I made by slightly altering one of our patterns, and–you know–the usual stuff around here. We keep busy, and I’m sure you do too. 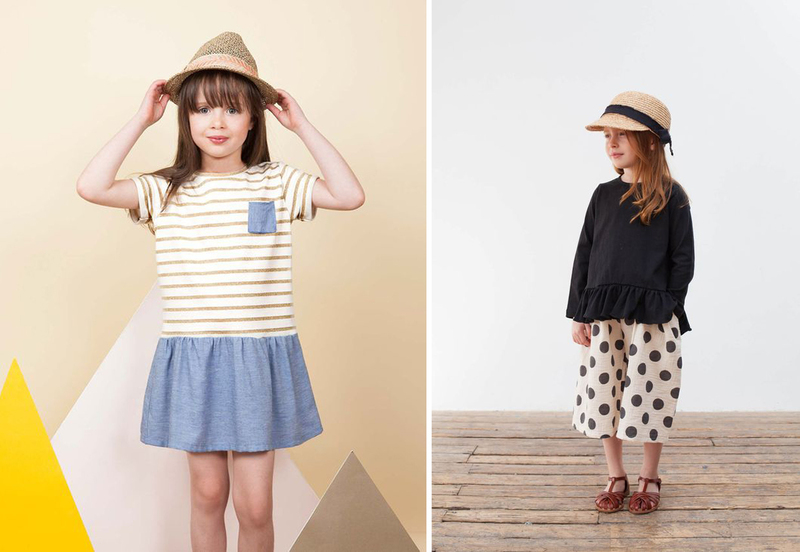 I adore the girls dress with the striped top and woven skirt/pocket! The Lunch Box tee would indeed be so perfect for this look. However, I have had bad luck in the past while attaching a woven skirt to a knit top – do you have any suggestions/tips for preventing the knit hem from getting stretched out while sewing on the woven skirt? Sure, a couple of ideas for you: try fusing a narrow strip of interfacing to the hem of the knit before stitching, and sew with the knit fabric underneath (against the feed dogs). You could also try using a walking foot. I’ve even held one finger down immediately behind the presser foot to force the fabric to bunch up a bit. I’ll try to demonstrate that technique in a video sometime soon, ok? Thanks for the tips! I always use the dual feed on my Bernina, so at least that’s a step in the right direction:) I will give your other ideas a try – thanks so much for the suggestions, and for the potential technique video.